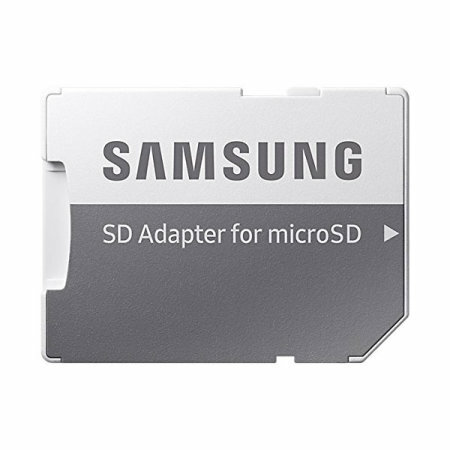 Full HD compliant Class 10 performance Micro SD Card. 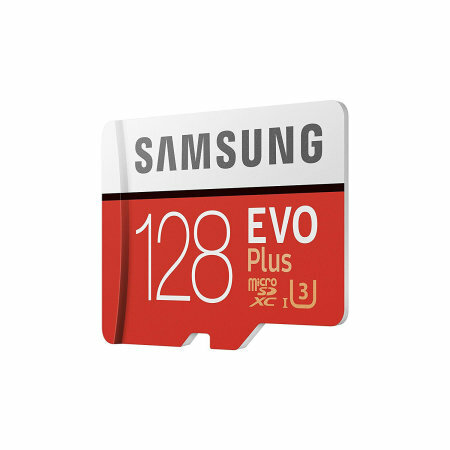 The 128GB Samsung Micro SDXC EVO Plus card safely and effectively stores all of your precious data, images, video and more. The Micro Card fitted straight in to my phone and started working straight away. It has given me extra storage and has integrated perfectly with my phone. I am very happy with it. 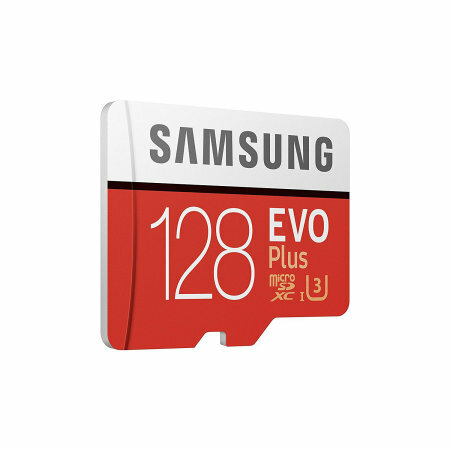 Save up to an incredible 27,200 photos, 17 hours of HD video and 6 hours of 4K video with the Samsung EVO Plus 128GB MicroSDXC card. Capture the moments that matter as vividly as you can remember them - the Samsung EVO Plus range allows you to shoot beautiful full HD and 4K videos that keep each memory safe, sound and as clear as the day it happened. 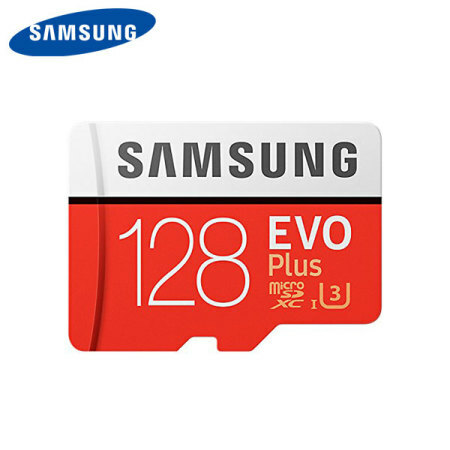 Save your precious photos and videos fast with this ultra high speed memory card from Samsung. Featuring UHS-1, the EVO Plus range can capture photos and videos two times faster than standard MicroSD cards. 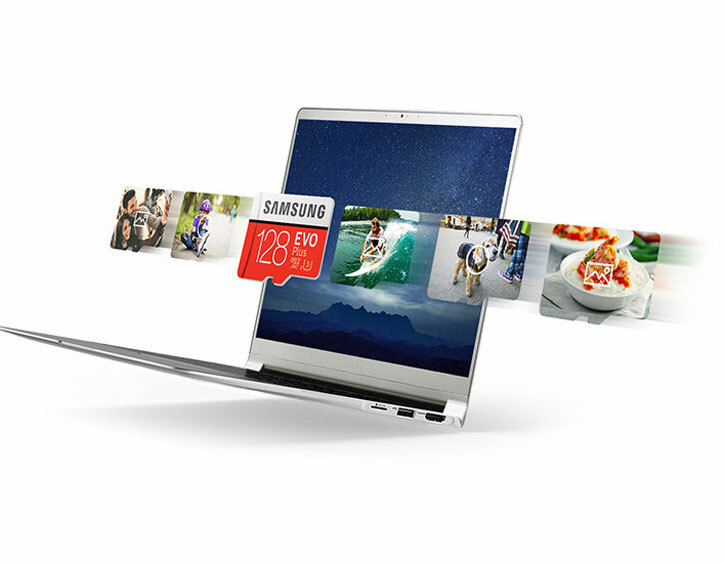 Transfer speeds are also improved, enabling you to transfer hundreds of photos per minute. With a transfer speed of 100MB per second, you can spend less time transferring and more time capturing the moments that matter. The world's most trusted and leading technology company brings you a Full HD compliant Class 10 performance Micro SD Card. 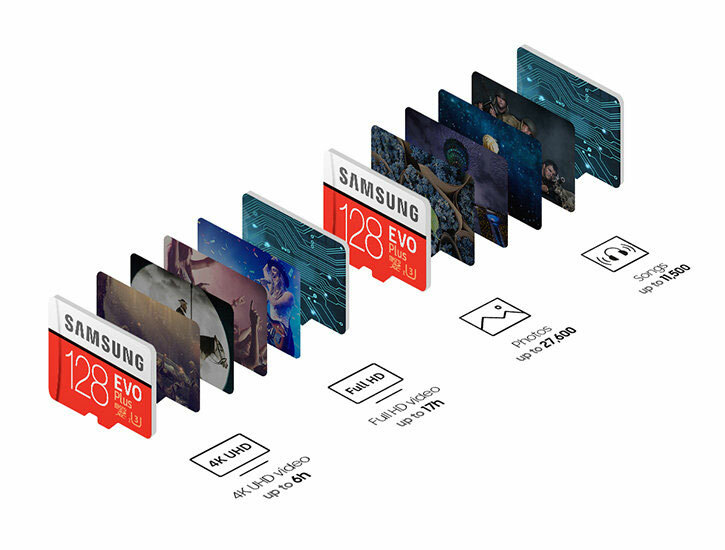 With proven experience for 19 consecutive years, Samsung memory cards deliver the highest level of performance and protect your special moments no matter what life throws at them. 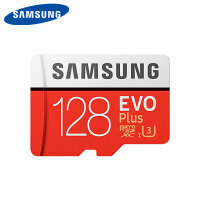 The Samsung 128GB MicroSDXC EVO Plus Card safely and effectively stores all your precious data, images, video and more. 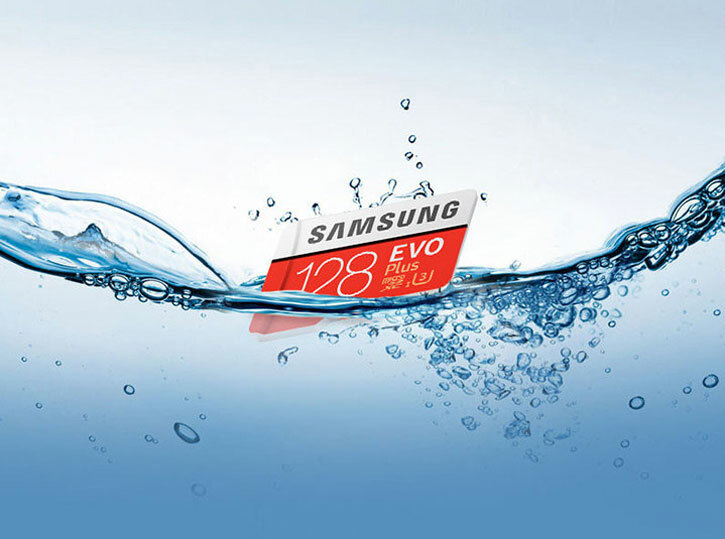 The incredibly tough MicroSD card features water proof technology in the form of an EMC coating. This has been tested by submerging in seawater for 24 hours. So even if your device falls in the water, your data will be safe. 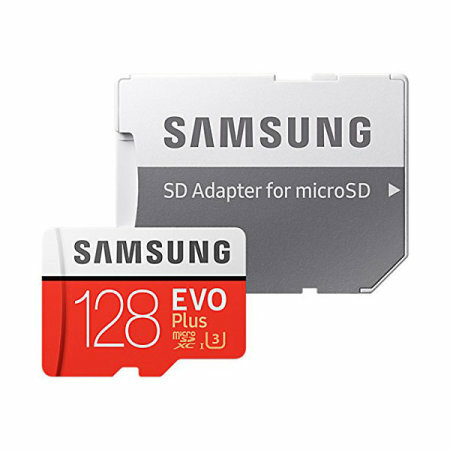 Universally compatible, this Samsung MicroSDXC EVO Plus card can be used with any tablet or smartphone which includes a Micro SD slot. This allows you to add 128GB of extra storage capacity* to store your favourite photos, music and movies on your mobile devices. 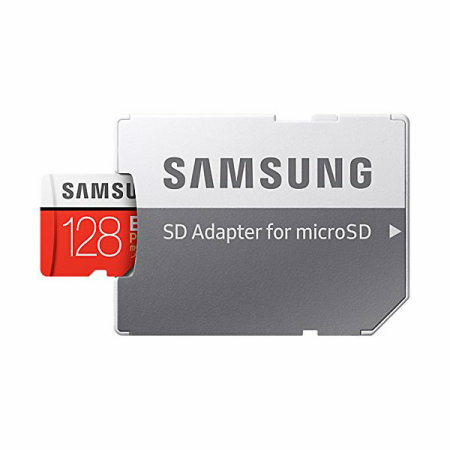 The Samsung 128GB MicroSDXC Card can withstand the pressure of a 1.6 ton vehicle, providing the ability to cope with everyday impacts. Data can be damaged by the magnetic force expelled around home theatre systems, however the 128GB card can resist a magnetic field of 10,000 gauss - equivalent to the level used in an MRI scan. Write: up to 90MB/s with UHS-1 interface. Actual speed may vary depending on use host device conditions and environment.